Boudreaux and his wife Clotille lived on a little farm just outside of the city of Mamou, Louisiana. 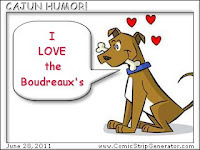 One day Clotille said, "Mais, Boudreaux, you have to get rid of dat dog. All he does is lie under de front porch and turn over da trash cans." Boudreaux said, "Okay Cher. I'll get rid of him." He put the dog in the pickup, drove down the road a couple of miles, and dumped him out. He drove home and in a few minutes the dog showed up. So he put him back in the truck, drove several more miles and dumped him out. After Boudreaux got back home, the dog showed up again. Clotille said, "You have to take him out and drive around and around a lot in circles, den dump him out. Dat way he won't know da way home." Boudreaux said, "You some smart, Clotille, and dat's why I marry you." Boudreaux again took the dog, and drove further out. Then he drove all around and zigzagged in and out the back roads a lot then dumped the dog out. He started back home but pulled over and parked and called Clotille on his cell phone. "Has dat dog come back yet?" Clotille answered, "Yes, he just came in." Boudreaux said, "Well, put him up to da phone - I'm lost." ... Ahheee! !